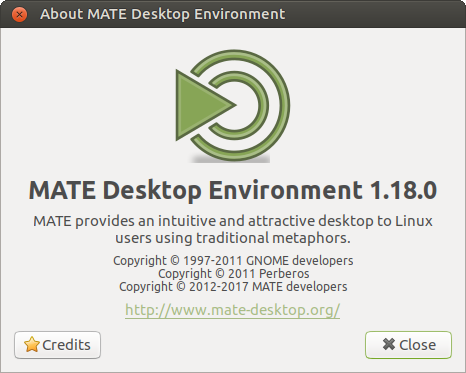 After 6 months of development the MATE Desktop team are proud to announce the release of MATE Desktop 1.18. We’d like to thank every MATE contributor for their help making this release possible. The release is focused on completing the migration to GTK3+ and adopting new technologies to replace some of deprecated components MATE Desktop 1.16 still relied on. The entire MATE Desktop suite of applications and components is now GTK3+ only! All GTK2+ code has been dropped including the --with-gtk build option. Completed the migration to GtkApplication from libunique. Added libinput support for mouse and touchpad. Separate settings for handedness (left/right-handed) and motion acceleration/threshold. Much improved accessibility support (particularly for visually impaired users). Many thanks to our friends at Hypra.fr for their contribution! Added a copy queue and copy pausing. Asking confirmation before moving files to the Trash. Support for back/forward mouse buttons for directory navigation. Notification when ejected drives are safe to unplug. Lock screen will load the users selected background instead of the system defined default. Added desktop actions support for additional launch options. Added support for Menulibre menu editor, if installed it is preferred over Mozo. Added ear and war to the supported types list. Check the rar/unrar version to the correct date is shown. Fixed compress rar and 7z split into volumes. Notifications now implement action icons support, for example playback control icons used by media players. Reworked the font viewer to add font browsing mode, support for TTC fonts and expose it in the menus by default. Replaced deprecated upower suspend/hibernate functions with ConsoleKit2 equivalents. MATE Terminal adds the ability to close tabs with middle mouse button. Atril, the document viewer, has much improved page load times and adds support for unarchiver used by some comics. Lots of deprecated GTK+ methods have been replaced and many bugs have been fixed. The plugin systems, and all C and Python plugins, in Eye of MATE and Pluma have been ported to libpeas. Translations are updated. Thank you to our team of translators! A number of memory leaks have been plugged. Here is a more detailed break down of what changed. Update engrampa NEWS to use consistent, project wide, markdown-like formatting.